Nigel Farage, bloke and fraud, wins Brexit. Nigel Farage, leader of the U.K. 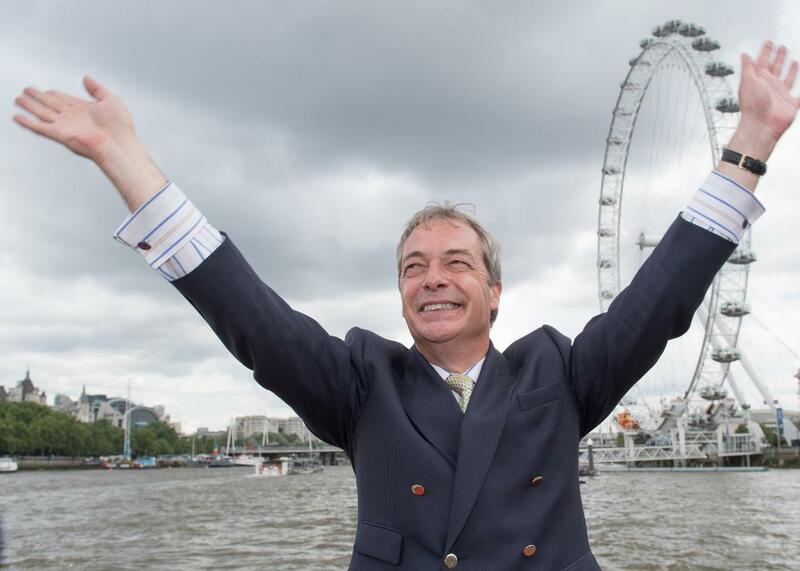 Independence Party shows his support for the “Leave” campaign aboard a boat on the River Thames on June 15 in London. Nigel Farage may be the dumbest man ever to outwit the smartest politicians in his country—but that’s exactly what he’s done. Just after the polls closed in Thursday’s EU referendum, Farage, leader of the pro-Brexit U.K. Independence Party, said he thought his side had probably lost; six hours later, he was delivering a triumphant speech in which he called for June 23 to be declared the United Kingdom’s Independence Day. Last May, when UKIP came out of the general election with only one member of Parliament—half its pre-vote total—he resigned as party leader … only to unresign less than a week later. During the Brexit campaign, he unveiled a campaign poster that was widely decried as racist. The night before the vote, he pulled out of a high-profile TV debate, offering only vague “family reasons” as explanation. And yet, by dog-whistling to Little Englanders, he emerged as the referendum’s biggest winner. Farage has a reputation as a survivor. At 21, he was in a serious car accident, which “left him in traction and unable to take a bath for 11 months,” and a little after that he was diagnosed with testicular cancer. In 2010, while campaigning during the general election, he emerged from a plane crash bloodied and semi-conscious. But it’s his refusal to obey the rules of politics, and his expressed disdain for politicians (even though he is one), that make him so popular. The New Statesman’s Jason Cowley said, “One of the attractions of Farage to some working-class voters … is that he is unashamedly himself: he knows what he thinks and how to articulate it in simple, direct, accessible language.” By being mouthy and boozy and at times impolite, he avoids seeming like a politician—though that’s exactly what he is. He’s a man of the people—even if he is a privately educated former commodities trader. Like Donald Trump, Farage is a xenophobic populist who has twice married foreign-born women. His first wife was Irish, and he is currently married to a German national—their two daughters (he also has two sons from his first marriage) are being raised to be bilingual. In other words, he doesn’t actually have any principles. On Friday, Farage’s habit of inconsistency was on display when he told a morning talk show that a “Leave” campaign pledge to take the $350 million per week the United Kingdom has been sending to the European Union, according to the Leavers, and redirect it to the National Health Service was a “mistake,” and that he wouldn’t guarantee that the money would be spent that way, even though that promise was one of the centerpieces of the “Leave” campaign. In the speech he delivered in the early hours of Friday, Farage said the “Leave” victory was for “the real people, for the ordinary people, for the decent people.” I guess if those so-called ordinary people will vote for a man who has a long track record of changing his mind, or lying, they can hardly complain when he does it again.